The very few times I’ve actually gotten an an eyelash stuck to one of my eyes, I couldn’t even feel that there was anything. I noticed it only because I saw it in the mirror, but then it got extremely irritating to look at, because even if I couldn’t feel it was there, it still *looked* like it was painful! GAAH! This happens to me A LOT. What was really creepy was one day that I was looking in a mirror, trying to fish one out, and I blinked. It disappeared up under my eyelid…AND DID NOT COME OUT. This lead to my theory that I have an EYELASH GRAVEYARD behind my eyeball where all the dried up forgotten eyelashes just pile up. I thank you for the nightmare fuel. Oh also is there any way we could suggest ideas for this comic? Ok. Just thought I’d ask. Love the comic by the way. Keep up the good work! 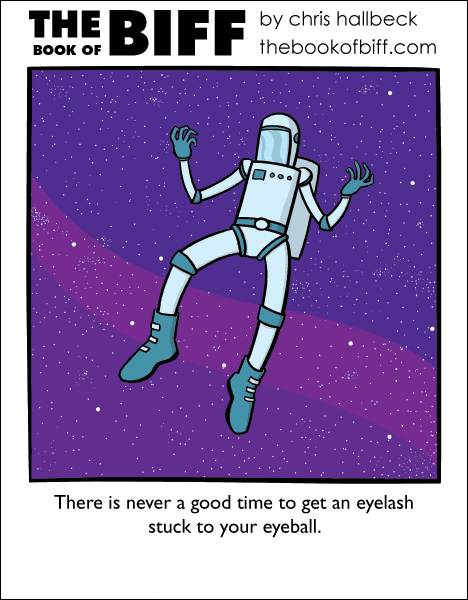 It’s also true that there is never a good time to have an eyeball stuck to your eyeball.